With NDSU’s 2016-17 sporting calendar drawing to a close, it is time to reflect on the year that was for the Bison. The past season yielded some gripping and dramatic contests on the gridiron, the hardwood and the diamond. As the book closes on an exciting year, here are the top five sporting events from 2016-17. A hat trick, the first of her career, from sophomore Holly Enderle saw the Bison pass in-state rivals UND by a final tally of 4-1. Enderle got the scoring started in the eighth minute with her first goal of the season off of Lauren Miller’s corner kick. The sophomore found the back of the net a second time in the 26th minute to double the visiting Bison’s advantage. Less than one minute later, the Fighting Hawks clawed back into the game with a goal from Katie Moller, but Enderle completed her hat trick in the 33rd minute to bury the Hawks. In a contest that tilted back and forth, the Herd ultimately bested Iowa State University, topping the Cyclones 25-16. NDSU lost the first two matches, but Mitch Friedman, Clay Ream and Andrew Fogarty won the following three matches to give the Bison a 10-7 lead. The Bison ran up against two nationally ranked wrestlers in the 174-pound and 184-pound matches, allowing ISU to go out in front 16-10. In the first of the final three matches, Cordell Eaton recorded a major decision to bring the Herd to within two points. Senior Ben Tynan followed up with a pin the 285 pound class to earn six points for the Bison and give them a four point lead. Fellow senior Josh Rodriguez won the final match of the day with a technical fall to cement the Herd’s victory over the No. 14 ranked Cyclones. In the opening game of a critical series against the leaders of the Summit League, the Bison clipped the Oral Roberts Golden Eagles by a score of 10-7. Pitcher Luke Lind conceded two runs in the third inning, but the Bison immediately rallied around their pitcher to tie the game in the home half of the frame. Lind was unable to steady himself, though, giving up three runs in the fifth inning prior to being removed. Alec Abercrombie homered for the Bison to bring the deficit to two, but Chris Choles, who relieved Lind, gave up a run in both the sixth and seventh innings. The game turned for the Bison in the bottom of the seventh inning. Mason Pierzchalski knocked in two runs with a single to narrow ORU’s lead to 7-4. Ben Petersen and Logan Busch both walked to drive in runs. Following Busch, JT Core singled to bring home Petersen and Pierzchalski and take an 8-7 lead. In total, the Bison put seven runners on base and plated five runs, causing three different Golden Eagles hurlers to be used. The Bison tacked on two insurance runs in the eighth inning to secure the 10-7 win and gain an important win over the Summit League leaders. The Bison football team pulled off a stunning upset over the University of Iowa Hawkeyes at Kinnick Stadium. After the Herd jumped out to a 7-0 lead courtesy of linebacker M.J. Stumpf’s pick six, Iowa quarterback C.J. Beathard threw two touchdown passes in the second quarter to give the home side a 14-7 lead. King Frazier’s rushing touchdown with 8:06 remaining in the third quarter tied the game for NDSU. Beathard tossed another touchdown in the third quarter to give the Hawkeyes a seven-point advantage again. In signature Bison fashion, NDSU cobbled together a 15 play, 80 yard scoring drive, capped off by senior Chase Morlock’s touchdown reception. The subsequent Iowa drive was held to a three-and-out, giving the ball to the Bison with less than two minutes to play. The Bison drove to the Iowa 20-yard line, and kicker Cam Pederson narrowly banged a field goal through the uprights as time expired for the 23-21 triumph. Iowa, ranked No. 11 at the time and coming off of a season which ended in the Rose Bowl, became the Bison’s sixth consecutive FBS foe to go down. 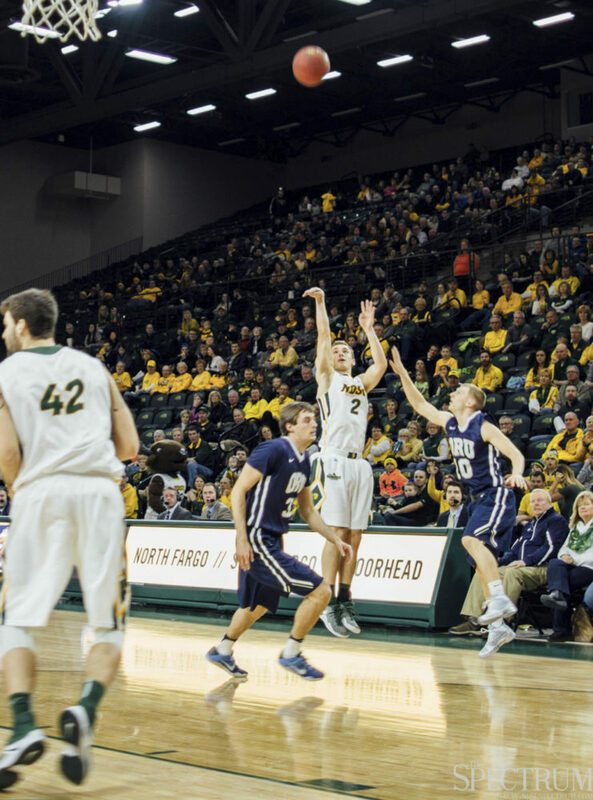 On senior day at the Scheels Center, the Bison men’s basketball squad got the better of Western Illinois, outlasting the Leathernecks in double overtime. The game, undoubtedly the most enthralling of the Sanford Health Athletic Complex’s inaugural season, featured 20 ties and 14 lead changes. In the SHAC’s inaugural season, a basketball highlight takes the top spot in our list. Fittingly, the two seniors being honored, Carlin Dupree and Dexter Werner, led the Bison with two legacy-defining performances. Dupree scored 22 points and in 43 minutes. Werner recorded 21 points and four blocks. 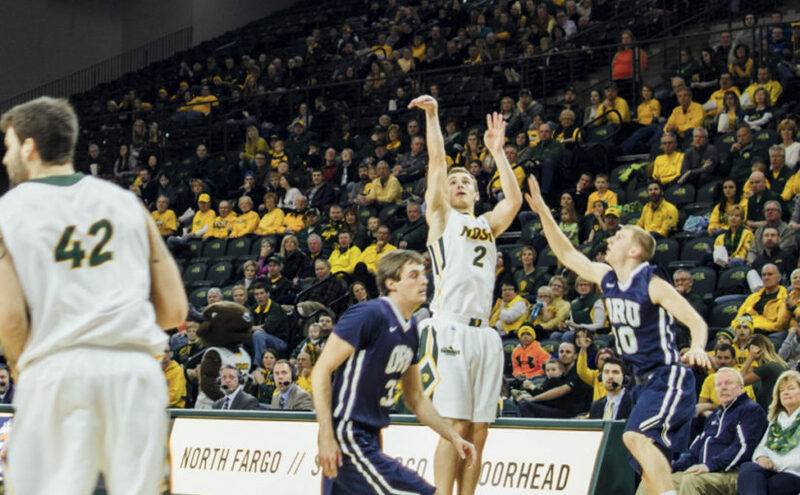 It was the duo’s clutch play down the final stretch that cemented the Bison’s win. NDSU trailed by seven with 2:57 remaining in the second period, but rallied and tied the game on a Dupree bucket with 47 seconds remaining. In that time, Werner and Dupree were the only Bison players who scored. Unable to end it in the first overtime, the Bison throttled the Leathernecks 13-4 in the second overtime period. Six of the 13 double overtime points came from Dupree. NDSU shot 51.8 percent in the game en route to the 100-91 win. Head coach Dave Richman offered touching tributes to his seniors in front of what remained of the 4,696 fans who had attended the game. With so many fantastic moments from the past year’s athletic seasons, here is to hoping that 2017-18 brings many more.